In May, Bryan Wilson, age 11, was named the most recent Buddy Bison Student Ambassador, a program created in 2015 by the National Park Trust. Bryan has been to 21 parks this year alone and is a regular volunteer at Navajo National Monument near his home on the Navajo Nation, where his father is a physician for the tribe. He attends an online school, Arizona Connections Academy, which allows him the freedom to travel and explore. His mom, Nina, said when they moved to the area, Bryan said he was bored and asked her to open an Instagram account where he could post photos of his adventures. 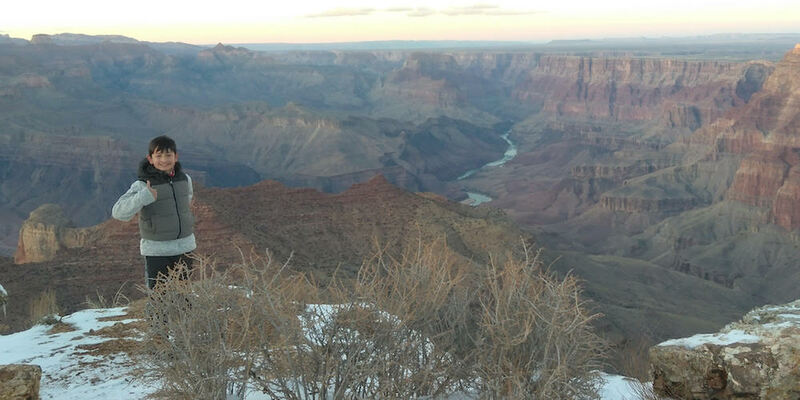 Arizona Highways spoke with Bryan to learn more about his love of the outdoors and what he hopes to accomplish as the next Buddy Bison Student Ambassador. What is your favorite place you’ve visited and why? That’s a hard one. All the national parks are beautiful, but I would have to say my favorite national park would be Yellowstone National Park, because of the beautiful scenery, nature and the animals. Why did you want to become a Buddy Bison Ambassador, and what do you hope to help with? I wanted to become one because diabetes runs in our family, first of all, and I see very little kids walking around with very large sodas and chips in their hands. I was very stunned to see how many of them have childhood obesity and diabetes, so I wanted to help out. One of the initiatives that Buddy Bison stands for is getting kids outside, active and healthy, and I thought that would go really well with the Navajo Nation. That’s why I wanted to become a Buddy Bison. My goal is to end childhood obesity and pre-diabetes on the reservation. You’ve had the chance to speak with elected officials. How was the experience? That was wonderful. I got to talk with the Navajo Nation Embassy and a couple of other legislators, and that was pretty cool. I shared the Buddy Bison initiative with them and they liked it so much, they’re going to help it go wide. How do you use Instagram? I like to use Instagram for sharing my adventures and encouraging kids to get outside and active and healthy. I gained several friends like Tigran, who was the first Buddy Bison Ambassador; I really like him. We met at Channel Islands National Park, and then I volunteered at the White House Easter Egg Roll and we met again there. What is your favorite trail or hike in Arizona? My favorite trail or hike is Betatakin. It’s an aspen trail that leads you to the Betatakin Overlook, which is a cliff dwelling in Arizona in Navajo National Monument. To follow along with the adventures of Bryan and #BuddyBison, check out his Instagram, @junior_ranger_bry.